Unveiling a programme of PZYK CINEMA back in August with Czech director Karel Zeman’s kaleidoscopic animation The Fabulous Baron Munchausen (1962), Liverpool International Festival of Psychedelia and FACT Liverpool bring it to a close tonight just ahead of the festival itself. 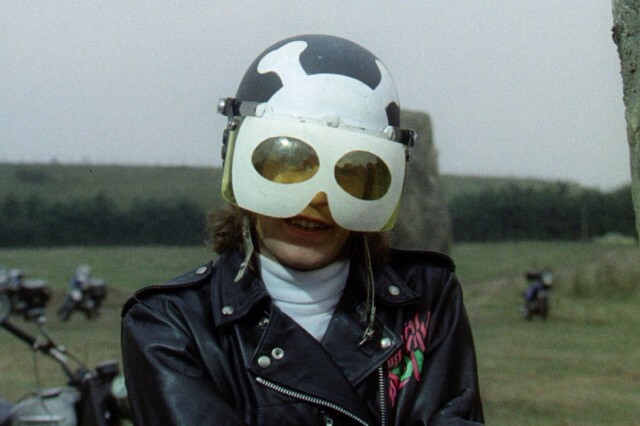 Made almost one decade later, Australian-born British director Don Sharp’s 1973 horror Psychomania – aka The Death Wheelers, The Frog or The Living Dead – sees motorbike rider Tom Latham (played by Nicky Henson, who went on to star in Downton Abbey, The Bill and other British soaps, like the majority of the cast) terrorize his local village with fellow gang members known as “The Living Dead”. Scenes shift from bikers speeding on main roads knocking motorists off track to their death; to crashing into supermarket aisles, wreaking havoc on civilians. In these moments of raucous violence, Sharp’s horror is more like comedy. It’s hard to take the gang seriously — especially in those skull and crossbone helmets. Protagonist Tom vows to return from the dead, and actually succeeds with the help of his mother Mrs Latham (Beryl Reid), who in her spare time holds séances in their trendy mansion home. After Tom rides off a bridge into a river to his death, a fellow gang member later sings: “The world never knew his name but the chosen few know of his fame, come join his company riding free, riding free.” Sharp continues a supernatural vibe throughout the film’s narrative; helped by recurring images of a frog Tom captures from a graveyard, accompanied by a moody, eery guitar-heavy soundtrack. Eventually, the rest of the gang follows suit and a sequence of bike rider suicides ensue. But what about the psychedelia? PZYK CINEMA promises “themes of excess and overwhelming sensory experiences”, and Sharp doesn’t disappoint. One scene in particular, when Tom’s girlfriend Abby Holman (Mary Larkin) appears to have risen from the dead, is one of Sharp’s most effective depictions of the blur between reality and the fantastical. We are shown Abby lying in her bedroom after overdosing on pills. This fades and blends subtly to a shot of The Seven Witches: a countryside landscape dotted with large, stone boulders where Tom first appears after coming back from death. The camera’s focus shifts between the nearby greenery to the standing stones in the far distance — resembling the feeling of first awakening from sleep. It is revealed that Abby did not succeed in her suicide attempt, and wakes up in the hospital from her vision. This transition from a dreamy environment to a clinical hospital room brings viewers right back to reality. Sharp is generally associated with his earlier works of the 1960s made with infamous horror studio Hammer: well-known for its outlet of corny Gothic dramas, comedies and thrillers. Rasputin: The Mad Monk (1966) saw Sharp direct actor and Hammer poster-boy Christopher Lee, who also starred in the studio’s biggest hits as Count Dracula. Sharp’s contribution to film is situated here within the Hammer horror legacy. Yet Psychomania arguably adds yet more elements of the hallucinatory and the supernatural in this Benmar Productions film than in any of Sharp’s Hammer works. Situating Psychomania at Liverpool International Festival of Psychedelia offers contemporary festival-goers an amusing cinema experience at times. But it also gives an insight into the ways that film directors of the 1970s attempted to create sensory experiences for audiences through cinematic techniques. The camera fade-outs, as with Abby’s hallucination earlier described, serve as a blurring of reality to a dazed, dreamlike state. Visuals of melting, morphing and flowing repeatedly appear in Psychomania. Their placement in the narrative is not excessive, but the visuals themselves are, and heighten our sense of visual capabilities. Be prepared to snigger at the ridiculous, silly moments – at one point the frog appears hovering mid-ribbit in a mirror – but Sharp’s film maintains a mystical appeal, particularly in shots of Tom riding into the midst of a hazy, burning sunset.